smaller ore drives for the LHOS methods. AMC has conducted numerous studies to reduce dilution for mechanized narrow vein mining methods in operating mines. Methods have included long hole open stoping (LHOS) and mechanized cut and fill (CAF). Dilution can be classified as planned or unplanned. Planned dilution accounts for waste material incorporated into the stope when designing practical mining shapes. Planned dilution will depend on the vein geometry, thickness, orebody dip and local ground conditions. Unplanned dilution consists of waste, which is mined due to overbreak, which may result from poor drilling or blasting or as any waste incorporated during mucking. 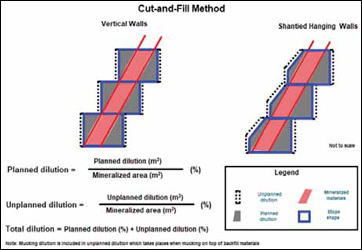 This article presents a high-level discussion of a study conducted by AMC to determine the optimum (minimum) dilution that could be reasonably applied to a narrow-vein orebody. • LHOS and CAF used at the mine, with potential to optimize sublevel spacing and mining sequence. • Orebody dips of 61°, 66°, 68° and 72°. AMC utilized the following formulae to determine dilution. Dilution ratios were calculated for planned and unplanned dilution. Total dilution is the sum of planned and unplanned dilution (Figure 1.1 and Figure 1.2). This method has been selected from numerous alternatives for calculating dilution. The optimum dilution is a trade-off against ore recovery. Given the value of the ore for this case study, recovery was given priority over dilution, with a target recovery of 100%. AMC used benchmarking and case studies to identify dilution experienced at different narrow-vein mines, guide equipment selection, drill-and-blast designs, and technical services procedures and recommendations. AMC examined the existing fleet of stope equipment (jumbos, LHDs, longhole drills, and bolters) at the mine and established optimal drill-and-blast designs for the selected vein widths, dips, drift profiles (square and shanty), drift size (height and width), and mining methods, which could immediately be implemented to reduce dilution, without additional equipment purchases. AMC also identified the optimal fleet of stope mining equipment for dilution minimization. This requires the purchase of small, low-profile equipment and reduced development sizes. AMC completed a comprehensive analysis to determine the minimized dilution for both LHOS and CAF using the formulae discussed. All of the selected vein widths, dips, drift profiles, and drift sizes were examined to minimize dilution and maximize recovery. The drift sizes considered had to accommodate either existing or optimal equipment. In general, minimum dilution is achieved using the optimal equipment and smaller ore drives for the LHOS methods, or the lowest practicable drift heights for CAF. Minimum dilution for LHOS ranged from 66% (1.5 m stope width, 0.5 m vein width) to 9%. For a 5-m vein width, a minimum dilution of 9% is achievable in good ground with a 20-m sublevel interval and either a 5-m wide by 3-m high ore drive or a 5-m wide x 5-m high ore drive. In fair ground, the dilution projection increases to 10%. Key results for CAF method was 28% for a 1.5-m vein width and 11% for a 5-m vein width. AMC used the ideal stope and drive dilution results for the basis to create drilland- blast designs, which included slot raise, production rings and powder factors (PFs) for LHOS. The drill-and-blast designs for CAF included drill patterns, suggested explosive loading and PFs. An example of LHOS design for an irregular vein shown in Figure 1.3. To target idealized dilution, AMC recommends closely monitoring three areas: drive dimension optimization, drill-andblast practices, and overall quality control. For the ore drives, engineers should consider the narrower veins and purchase equipment that fits into 2.7-m x 3-m drift. They should also consider the use of shanty ore drive backs. Development into orebody hanging wall should be minimized. Technical support processes for designing narrow vein stopes should be reviewed. practices and overall quality control. As far as the blast design, engineers should consider large relief raises (i.e, V30-760 mm) for slot development. They should also reduce drill hole size and implement recommended drill patterns, including perimeter blast control. Guide rods should be used to reduce deviation. For stope blasting, low-density emulsion should be used in narrow-vein stopes. 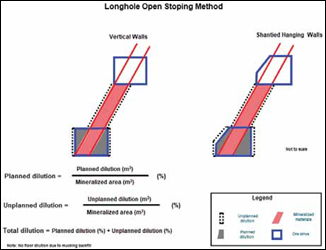 Engineers should properly implement the stope (long-hole and ore drive) blast designs provided. Trial work processes should be developed to optimize the drilland- blast patterns and reduce dilution. And, when it comes to ore quality control, all departments (planning, surveying, geology, geotechnical, ventilation and operations) need to provide input and signoff for stope and mine designs. The stope markup and reference line should be set by surveyors. A surveyed drill setup process should be implemented to improve drill hole accuracy. Blasting engineers should be involved continuously with blasting crews. The cavity should be monitored and surveyed for every stope blast. Engineers need to perform regular, quantitative reconciliations between the design and the blast results. The results should be shared with stakeholders to justify implementing changes. Paul Salmenmaki is a senior mining engineer working with AMC Consultants. He can be reached at psalmenmaki@ amcconsultants.com.